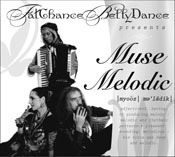 From FCBD and producer Kristine Adams: "Muse Melodic" was conceived in the early part of 2009 as we watched many loved CDs go out of print, well used tracks left only to live in the land of mp3's. It made me stop and say, why can't we put together a compilation CD, we know enough amazing musicians to do it. I presented my idea to Carolena and she was kind enough to have enough faith in my charm, gumption, and hard work to give me the thumbs up. A year and a half later with a lot of help from all the musicians listed on the CD and the most amazing boss ever, Carolena Nericcio of FatChanceBellyDance, I am proud to present to you a modest collection of music that inspires us. I hope it inspires you too."